of the hangout (they describe the quotes more as “summaries”, than exact quotes). Near the end, there’s a transcript of the clip that was shown – so if you don’t want SPOILERS, stay away from that section. PJ: Ian McKellan loves napping, so I once sneaked up on him while he was napping between takes and yelled “And…Action!” causing Ian to jump up in surprise and straighten up as if he had to act. RA: When Martin brought his son and daughter to visit the set, I lent Martin’s daughter some of my prosthetic hands, and she waved to Martin with them on. PJ: I’d like to say 15 or 25, but then I’d be like a marketer or salesman. If you have three or more clips without any of the principle characters, the audience will zone out, so we had lots of shots of the main characters. There were many storylines coming together even in the middle of the battle, so it’s not just a bunch of action; the battle is almost secondary to the characters. RA: It was filmed in multiple locations. I got caught in a current at one point, got pulled under for a bit and had to be pulled out by two stunt guys since I was wearing all the dwarf prosthetics. Q (to EL): Have you always wanted to play an Elf? Did it live up to your expectations? EL: Who doesn’t want to play an Elf? EL: It lived up to my expectations. I was giddy every time I walked onto a new set. I’ve always been a huge LotR and PJ fan. When they first asked me what size prosthetic ears I wanted, I wanted the largest, but they gave me the smallest, which didn’t work out. The whole makeup/prosthetics time for me each day was 2 hours. PJ: I’ve spent more time with Tauriel than Evangeline, so seeing you is unusual to me. I’m used to the actors in their costumes, rather than real life. RA: It’s useful for storing stuff like little bits of food. Host: Did you guys ever want to sleep in your costume/prosthetics to avoid all the time spent to put them on and take them off? EL: Absolutely not; you couldn’t have paid me to do that. My costume, wig, and prosthetics were nasty after all the action scenes and sweat. PJ: I’ve seen both RA and EL work themselves to exhaustion. 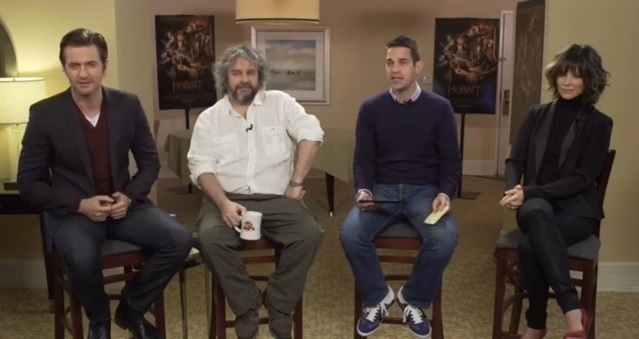 Q (to PJ): 10 years ago, Return of the King was released; in a few days, the Hobbit: DoS comes out. How did you feel after filming the last scene of the Hobbit movies? PJ: For many of the film people, they’re done after the filming. For me, it’s just a new beginning; I have to do all the post-production. So, saying goodbye to friends and people you’ve been working with for 18 months is hard, but you can hope to work with them in the future. You enjoy the relationship of working with these people and having mutual trust and understanding. Q (to RA): How do you find empathy for Thorin, given his actions in the movie? RA: If he had to stand in court for some of the things he’s done, the promises he’s reneged on …. I don’t think I’d always agree with Thorin. There’s a scene in front of the Mountain where Balin is arguing with Thorin, telling him that Bilbo shouldn’t have to come into the Mountain. Sometimes though, I do agree with Thorin. EL: Seeing your performance, I realize that the Thorin side must have won; the way you acted, the audience would see some of the things he does as not immoral, but just hard decisions. Host: And here’s the new, exclusive, and never-before-scene clip! The dwarves look at each others, then enter the barrels. The Elf is sleeping on a table, presumably drunk. Bilbo counts to make sure all the dwarves are in barrels. Once they’re all in, Bilbo starts walking away. Host (to PJ): Are you making tweaks to the movie all the way until the end, when it comes out? PJ: Ha, no. On the way to the premiere, I had a bag with the hard drives holding the movie, so if anything had happened to me…you wouldn’t have had a premiere.